So it’s 2007: shouldn’t there be more cyborgs? Well, for a mere $25.00 (or less), you can be one big step closer to being one yourself. How so, you ask? Click the following link to to find out! Turning this little critter adjusts the gain–an adjustment my headset needed pretty desperately. Oh, but I’m getting a bit ahead of myself, aren’t I? The base of the plug is the ground. This will need to be connected to two things; the negative terminal of your power supply and the shield of your RCA plug (when you strip the cable, this will be the woven sleeve around the inner wire). The middle ring is the video, which connects to the center wire/pin on the RCA cable/plug. Finally, the tip connects to the positive terminal of your power supply. Double-check your wiring, plug the RCA cable into your composite video source, and connect your power. If all goes well, you should see an image! Now if you’re video device is PAL format (from Europe, UK, etc. ), you’re done! If, however, you’re device is NTSC (American), you’ll notice that the image in the headset is a bit messed up. Most modern devices will have a software setting somewhere that will let you change the video format, but there is a pretty simple hardware solution if not. Let’s have a look at that solution, shall we? First, we need to crack open the display housing. It’s glued shut, so prying is our only option (unless you have a sonic screwdriver, that is). Insert your presumably non-sonic screwdriver into the side with the cable coming out of it and pull away foreward (away from your face, if you were wearing it (which you really shouldn’t be at this point)). Doing this will pull the line low, whereas just scraping it off lets the line float. It seems to work fine either way, but it can’t hurt to play it safe. The “resistor” seems to be little more than a jumper, so you can actually just pop it off and bridge the blank pads with a bit of wire or solder if you’re lazy (like me). Pop the lid back on and there you have it: a wearable screen that can be connected to just about anything that plugs into a normal TV–and for less than twenty-five bucks! In the datasheet it gives the range as 0-Vbat (battery voltage) and the block diagram shows it going through a “level detector” (voltage threshold) and mixing it with the (level-/gamma-corrected) video. My guess is that it’s just a B/W video signal with a 0-Vbat swing instead of 1Vp-p. Of course, it would probably have to be genlocked with the input video. Also, using the middle pole for video and the end pole for the battery, isn’t that bad? As you plug it in you get voltage going in the video in, and back out the ground. Or between the voltage and video source pin… other such bad things. you know, there’s nothing (except out-of-stock on the site) to stop me from rigging two of these bad boys together, and then running dual output from a couple of tuner cards. Imagine, it’s stereoscopic 3D for $50. Even if you only used it as a digital still-shot stereoscope, it would be awesome! Then if you figured out how to render video separately to the two lines…. Hey, thanks for the kind words, everybody! I had a feeling they’d sell out pretty fast, as they had done so twice long before I posted anything. Luckily they do have a notification system, which is nice and spam-free. @draeath: Putting a switch is a good idea. I had thought about doing it myself, but I’ve never had reason to use a PAL signal in my life 🙂 As to the pin arrangement, I think you’re looking at it backwards. The positive supply is on the tip, yes, but it’s the female socket that’s supplying this voltage. This means that the battery isn’t connected to anything until the plug is all the way in. You get video going into the v-in and ground to video-in for a brief second, not the other way around. @Lokkju: Shhhh! Now they’re really going to sell out… I actually used that code myself when I bought this one, but I forgot to mention it here. Thanks! DAMN! it’s out of stock! I found one in the dumpster near my work place but it does not have ac adapter and its run on 5v. Can some one tell me how to make it to work? The model is X-eye. That car set would make a perfect cheap rear view camera/display for my RV. A shaving mirror would both magnify the tiny Kopin screen and do the necessary left-right reflection. Sold Out, BTW… wonder if they’ll ever restock that part? Nice work!!! You might be able to add color by replacing the white backlight LED with an RGB LED and sequence each color through. This would be very similar to what dlp projectors do, although it might be a pain on your eyes. You might check the backlight for unused connections, just in case they originally decided to make it color, but for whatever reason changed their mind. Roy, most video cards these days can actually render video separately in realtime. You might check to see if your video card supports it. Some video cards will render red-blue anaglyphs. Stereoscopy on a shoe string is a pretty cool idea. 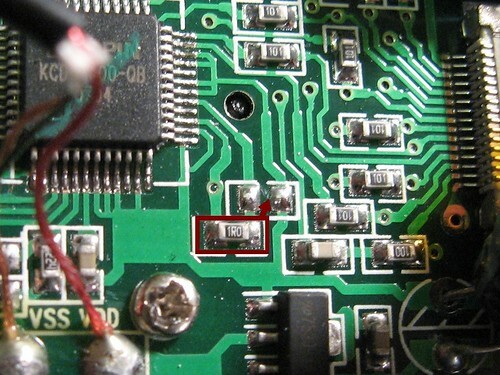 Jake, instead of desoldering the resistor, why not use an M connector? Or in other words, use aluminum foil to bypass it Macguyver style. Spy Video Car Replacement Part – Limit One per Customer! haha thats hilarious one per that is just great but they must be restocking because now they have a waiting list to buy it! Think it would be easy to pull these and add IR LEDs or a separate IR LED flashlight to make a cheap yet functional night vision goggle? They say they expect more by the end of the month. Seems like they should be getting a HUGE shipment if a lot of hack-a-day is watching this item. Jake, what a wonderful hack! So sorry the website is out of stock. Our engineering group has a bin of extra headsets (pre-production samples, engineering test units, etc.) we’d like to make available to 10 clever hackers. Email us with a one-paragraph proposal of what cool thing you’re going to do with your own cyborg headset. Best 10 answers we receive by 5PM tomorrow (Oct. 10) receive a headset. No guarantees–these aren’t production samples, but they’re free, right? I would love to have that with a color VGA, (or better,) display. It could be used as a TV monitor, gaming monitor, PC Monitor, whatever. The original XBOX uses 640 x 480, if I remember correctly. With an RCA connector, it could connect right to a game console or TV feed. Kopin has VGA and WVGA screens, but I wouldn’t even know where to start. Power, input, backlight…, way over my head. If anyone ever makes a set of instructions for a VGA model, I might stand a chance. The OSD signal is an analog signal… The OSD data is most commonly sent to the display processor in the VBLANK state. The OSD chip then converts it for display. The signal delay is 20 nanoseconds with a max of 30 ns delay. So try sending a signal of 1 volt with an on/off delay of 20ns. That should give you white, right? And black should be a signal of 2V with the same on/off delay. I don’t believe the OSD is a serial input. That BOB thing Shelby mentions is specifically for accepting text from serial or ucon. and overlaying it on a video signal. Maybe try a simple transistor video amp outputting 1/3 Vcc video with a 1/3 Vcc DC bias and send it a bilevel/gray image. I’m thinking black=trans/white=opaque. A lot of voltage regulators want “overhead” voltage to operate properly. The 78xx and LM340/350/317 in particular want Vcc to be >= Vout + 2, and those are very common designs. Assuming they didn’t use a low-overhead regulator here (not common in my experience) the ideal minimum supply voltage is 5.3. 6V is probably a more realistic absolute minimum since the whole purpose of a voltage regulator is to produce a constant voltage source, and any dip below 5.3 will produce a proportional dip in output voltage. Great gadget. Im going to be using mine as a HUD for our Honeywell RapidEYE dvr system. Im building the video TX/RX right now. This will be perfect for our officers. Mobile video surveillance is always a nice tool. I do a lot of fishing. 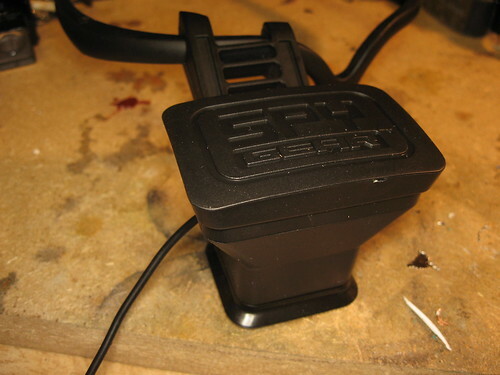 I wonder if I could hack my fishfinder to find the RGB, and Sync Signals to incorporate a small plug.. (say a SVID-type or x-pin mini DIN, or even a D-Type… ) .. to make a CYBORG-like eypiece to interface with my FISHFINDER? Imagine casting and at the same time VIRTUALLY SEEING where the fish are… OH YEA. Thanks for the HACK… keep on brother! now this is a sweet setup…now i have something i can use as a hud for my wearable pc…for cheap! i thought i was gonna have to replace the headset section for sure, but it’s remarkably stable when i put it on. one 9v jack and an RCA cable later, i’m able to watch my xbox 360 boot up on the headset. nifty! I think I’ve got the OSD figured out. Kopin didn’t have any details (I emailed tech support), so I took a closer look at the A300 controller and it suddenly looked kinda familiar. Came up with the Freescale (Motorola) VirtuoView display driver: MCVVQ111AFB. Page 12 & 14 describe the OSD operation and it looks exactly like the Kopin A300. Basically, there’s two thresholds: below the bottom and it’s not adding OSD video. Above the 1st and it adds black. Above the 2nd and it adds white. You’ll have use the vertical and horizontal sync signals and come up with your own font(s) and graphics. But it’s easier because than regular NTSC video because you can use the pixel clock to know when to go to the next pixel. I’ll add it to my project list! Nice hack, thanks for the info. I got mine yesterday and pluged it into the reciever for my Swann Night Hawk wireless camera which has a built-in IR LED array to make a homebrew NVG. The coolest part is since the camera is powered by it’s on 9v battery, I can detach the it from my modded headset and plant it somewhere for remote viewing. Looks like they are back in stock (for the moment). I just ordered mine! Merry Early X-Mas to me. I’ve also ordered mine yesterday! I hope to find some “usefull” hacks for it! Ordered two, to try to balance out the insane shipping cost. I’m basicly paying the cost of three for two though. Unfortunately, with all the great press in the maker community, we aren’t able to meet the demand for the replacement headset right now. We didn’t anticipate so much interest in this as a stand-alone item, and it will take some time before our production capacity catches up with the demand. (We’re going full out to meet the Spy Video Car demand for the holiday season). If you can wait, we’ll notify you when we get the replacement headset in stock. The other option is that we do have inventory of the complete Spy Video Car available. In addition to the headset, The Spy Video Car is a remote controlled vehicle with a video camera mounted on the front to provide a first-person view from the vehicle for snooping and spying. The video image is transmitted via 2.4GHz signal and then displayed on a micro-LCD in the headset. Creative individuals could certainly imagine endless ways to reconfigure the various components that make up the Spy Video Car into new and exciting projects. 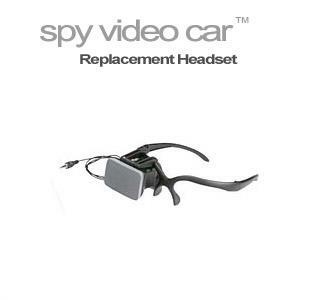 Because we are unable to fulfill your request of the replacement headset, we would like to offer you a $20 discount on the Spy Video Car. To receive your discount, just enter the coupon code HACKER during checkout. Of course, if you prefer to wait, we will e-mail you when we get the replacement headsets in (early next year). Sweet. I got mine in the mail today (they are back in stock). With a 9V battery and a few alligator clips I was able to connect it to my playstation in just a few minutes. Next I’m going to pop it open and switch it to NTSC. Thanks for the tip, this is going to be fun! I’ve got an old Sony VAIO laptop with no head (cracked LCD) – anyone know if it is possible to hook this up to it? If any of you can point to resources which can help me I would appreciate it (I’m a software developer and not much of a hardware guy). Man what a great and very inexpensive thing for my RC plane video downlink! Doing the mods was a snap and I had it working in no time flat! This thing has tons of bang for the buck! It’s as good or better than other viewers that cost MUCH more. This is off topic, and I am not very savvy at hacking, but I am an IT guy. The simplest thing for you to do is use a VGA cable to connect the headless laptop to a spare monitor. I do not recall ever seeing a laptop without a VGA out port. If you look on eBay, you should be able to find a replacement screen. They are not that hard to swap out, once you figure out which screws unlock the “laptop puzzle”. Once you see what the prices are running, you can decide if it is worth it to you. Or sell yours on ebay and someone else can rebuild theirs. I think a color VGA one I could connect to my xBox would be very cool. Looking at the M300 website, and it appears thatthis thing is driven by the A300 controller board. Would make sense. Perhaps data on the OSD line is given in the chip’s paperwork? *headdesk* should have paid more attention to comments. I just got an e-mail from shopwildplanet.com. They are taking orders on the headsets again (to ship in December). I used coupon code SMILES, and paid $27.45 (to be shipped U.S.P.S. Priority Mail). I plan to us a PAL/NTSC switch to flip the resistor between the circuit pads shown above. I will use this with my Sony Nightshot digital camcorder I got at a garage sale for $5 (they said it did not work, but the menu allowed me to reset it to factory defaults ;-). I just thought id toss a comment on what i will be doing with this headset. Im a regular airsoft player and have recieved the nickname of ‘Q’ for all the gadgets i create. The next one ive decided to make is a SWAT Wand (http://www.lecortec.com/vision_stick.htm) as you can see on that site its about $2300. The Wand basicaly allows the operator to look arround a corner or in a room for hostiles. Now connecting this HUD to a $25 wireless camera i purchased from ebay, ive made my own WIRELESS wand for about roughly $100. Im looking forward to geting the HUD i just ordered so i can get this gaget done! Thanks for the great article btw! Oops, I addressed my reply to Josh. I was actually answering Chaoslink’s post. ‘Scuze me. That makes perfect sense. Go for it. Let us know how it works out. FT job + a couple of contracts + a new AppleTV to hack on (like I said, software comes easier to me 😉 ) means no time yet for this. I will not let this one lay on the shelf like my in-car MP3 player! Wow, for my first hack this went extremely well! Rather than just coble something together, I wanted a nice enclosure that I could just plug the HMD and A/V cable to. I also wanted an LED power indicator and power switch. For once Radio Shack had everything I needed! Unfortunately, it is Radio Shack so I spent as much building the enclosure as the HMD cost. In retrospect I would cut out the power switch. I was momentarily panicked when I flipped the switch and the LED light didn’t come on. It took me a second to visualize the circuit before I figured out I actually had to plug the HMD in for it to work. DOH! So I took the extra step for nothing. I think I will build smaller rechargable 9V version (current one uses 4 AA) since this one is a bit clunkier than I would like. It is about the size of two decks of playing cards stacked. Morpheus: I hooked mine up to my wireless camera per your idea. With a couple of 9V batter adapters for my CCD and reciever and some electrical tape I made myself a nifty little night scope. Works pretty well and everything fits in canteen pouch on my belt. I’m not sure what the capabilites of the graphics card in your laptop are, but if it supports TV-out this might work for ya. Maybe, thanks Thaelog. I was hoping to somehow hookup the interface that used to go to the laptop screen, but I’ll check out that link, too. Chaoslink> Is there no TV Out at the Notebook you could use? I did the “Pre order” and they said after the first of the year…… well I just got the tracking number from USPS. I can’t wait!! I will be using for a down link for taking arial photos from an RC plane. My headset finally arrived (after one month and ten days)! Also with the euro-dollar exchange rate, I saved a lot of money! Hey, i’ve never soldered a thing in my life, and have no real knowledge of circuit boards and things, but i HAVE always wanted a head mounted display. Ironic no? Could somebody by any chance make like a step by step complete noobs guide to doing this so i can actually understand it? Even if you just take pictures of it step by step as you do your own with a paragraph or so explaining what you’re doing. If so that would be VERY much appreciated. And i’m in the UK, so it would only have to be up changing to NTSC, which i obviously have no need of. Very much optimistic thanks to everyone in advance. I am interested in using this as a PC monitor, running Dragon 9 voice recognition with MS Word. I am very interested in your tweaks for pc use and your conversion to usb power. Please email the details if you have prepared such. Thank you. I’m also very interested in your hacks 🙂 My email is krozgen (a-t) gmail (d-o-t) com. If you could link me to your site when the FAQ is up, I’d greatly appreciate it. Thanks in advance. That’s a great idea Daniel! I’ll have to incorporate USB/SV into my new adapter. They are sending out 2 free samples of their new product line. They even FedEx it for free! I’m going to be using the PPLX-9VB_2AA for my new adapter since it comes with a 9V batter compartment already. Which will be an improvement over my last one which requires me to unscrew the panel to change out the battery. Consequently, does anyone know of a DIY way to make a smart charger? I’ve been Googling with no luck. OK, well that was a quick purchase 😉 Thanks for the tips & tricks here. I tend to do a lot of LEGO, and some time ago built a Packbot out of the new LEGO NXT kit (search Youtube for “LEGO Packbot”). It works great, with BT remote control and on-board autonomy, but for remote control it needs video. I’ve got a small wireless cam, but having to stay by a TV or even laptop made this a less than completely portable option. But with this, I can take it into a cave I explore and be able to do some serious tight spaces work. *IF* I can get it hacked (I have a soldering iron, but it’s usually a source of burns…). Hi!mind if I ask, do you know what’s the difference between the Wild Planet Spy Video Car Translucent Red and the Spy Video Car (the black one)? Is it just the color or anything else. I am planning to buy this for my son but I don’t know what’s the difference bet the two. Hope somebody can answer my ? . Thanks! Have a nice day! Yup, I can confirm that they are exactly the same aside from color and the design of the wheels. The wheels are only slightly different, however, and do not have any noticeable effect on normal operation of the vehicle. I prefer the black one aesthetically, but the red one is pretty slick too. Jake, really interesting hack–went to wild planet and bought one within 5 minutes of reading your hack. I have one problem, I don’t quite understand your wiring instructions (mainly because this is one of my first ever hacks–first one was fixing a transistor on a 35mm camera). Will Ineed to buy a battery tray for the AA batteries and wire the audio and power to the 3.5mm jack you mentioned? What’s the chances of a picture or two of this part of the hack? Or, if someone else wants to give me a link? Man this hack is brilliant… I’ve been looking for a long time how to get a cheap head mounted display, compatible with my PC, but I’ve never thought of looking for it in a toy shop. You are a genius. But the guys at wildplanet don’t ship this stuff to Hungary 😥 any ideas on how to get one? I know it’s the other side of the Globe but I want to get my hands on one of those :'(. I’m feeling like a bit of an idiot here, but I bought one of these headsets, and tried to hook it up to a wireless camera and reciever. I went in and changed it to NTSC as described, but I’m still not able to make out a clear image. Is there something I’m doing wrong? I stripped the wires on the headset and soldered in battery power for the headset in order to get it to work, and still it doesn’t work. Can anyone help me out? There sometimes is a fuzzy image, but adjusting neither gain for the reciever knob helps at all. Thanks, this is my first hack and I’m already sucking. Hmm, sounds like you might have the wires reversed on the video-in. 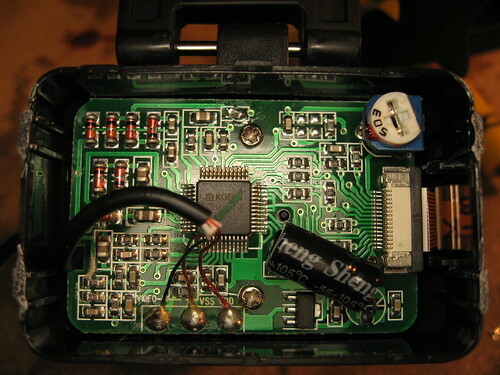 The shield (outer ring on an RCA plug) should be connected to the same point as the “-” terminal of your batteries, and the middle conductor should connect to the “video in” pin. That’s the only thing I can think of aside from a broken headset and wrong voltage. What are you powering it with, by the way? Just an update on my previous message. I bought the HMD from wild planet–$25 and no problems getting it. I must say, I achieved success with this first real “hack” of pre-existing gear. I followed the instructions by Jake–but instead of findng an old Walkman jack, I sprung for a new 1/8″ (3.5mm) female phone jack at Radio Shack (about one dollar). I also bought a 4-AA battery compartment ($1.59) which comes with a 9v-type attachment on the top–I figured this would put out a bit more than Jake’s 4.4V suggestion but that’s less than its limit. Then, I wired the black wire from the batteries to the lowest post of the 1/8″ jack, and the battery red wire to the top post (meaning, the one that touches the topmost part of the earphone plug). I also bought an RCA coupler for the video cable, and found an old yellow-tipped video rca cable in my supplies (if you’ve bought any electronics gadgets over the years, you’re bound to have as many USB and RCA cables as me!) I stripped the RCA plug off on one end and pulled the outer shield wire from the middle insulated wire. I attached the shielded wire to the black wire and post of the 1/8″ jack base post, and the middle wire to the remaining post on the jack (there are only three posts to choose from and two of the wires attach to that one base post). This gave the video display power, and then I attached the other end of the video rca cable to my wireless video camera receiver. It worked, but had the PAL format (the double image thing), so I knew I’d have to break open the display. Well, I opened the cable side, like in the photo by Jake, and found the little NTSC doohickey. I just scraped it off and hoped for the best. Success! It works, and I’m going to find a little compartment to stick the battery tray and wires into so they don’t come loose from movement. 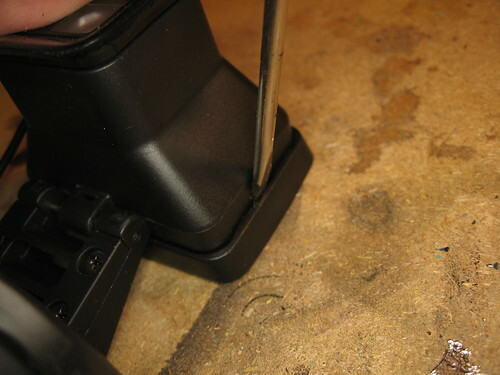 I’m also going to drill a hole into the compartment and attach the phone jack. I might use this at some point when working with home-built robots outside. Thanks Jake! My first real hack. I stripped a portion of the wire coming out of the headset. In it, there is a red, green and clear wire. I soldered in the battery pack so that the red line connects to the positive, clear is negative. Then (and this might be where the problem lies) I used a stereo coupler to connect the stereo tip on the headset to an adapter that is stereo to RCA, and that connects to the RCA cord going to the camera reciever. Anyways I hope this helps shed light on my problem! Thanks again for the help. This would be awesome hooked up to my Commodore 64. The C64 Resolution is 320 x 200. It’s perfect! They are taking orders on the headsets again. I just picked up the whole car and everything at a local (aurora, CO) wal-mart for $49. Can anyone elaborate on the “color capable” bit that’s listed in the specs at the top of the page? We only have a few headsets left in stock and then they will be gone for good. Wild Planet has told me they are unable to get anymore at the current price so they will not be reordering them as a standalone unit. Once the final few we are in the store are gone, the only way to get one would be to purchase the entire Spy Video Car. I just wanted to let you all know in the event you go to the site and find the link is gone in the next few days. We will be removing it once we have sold out of the final few we have left. Hey are you guys building that page to explain how to connect a laptop? Action shot, Camera looking through the headset. Doesn’t look all that great through a camera but up against your eye its pretty nice. When will these things be available again? I need 2 of them. does anyone know where i can find a very low lux camera for cheap? you say this is under $25, but where did you get a camera? Is anyone else hacking this for an iPhone version 2? The version 2 doesn’t have a 1/8 inch video out, so I bought a composite A/V cable which connects out of the bottom of the iPhone. I wonder if it’s worth hacking the HMD to use NTSC. Has anyone tried the devices under both and compared the clarity? FYI, the settings for the iPhone are under Settings-iPod-TV Out. I’ve been looking for a non-immersive HMD like this one so I can watch my Vodcasts on the subway on my way to work. I need to be able to see to navigate, and it needs to be lighter than this device is, so I’m planning to take the optics out of the plastic housing and hang them on a pair of buddy-hollys in using a 1″ stand-off so I can swing the eye piece out of the way. Because of this, it still made sense to break open the shell, even if I don’t eventually end up converting it to NTSC. and press straight down. The screw driver didn’t work for me, neither did a utility knife. I eventually found that a wood chisel could slide against the plastic and break the glue that hoilds the cap on. A little follow up. The hack went perfectly with the version 2. I didn’t scrape off the resistor because the iPhone can display NTSC/PAL. I tried it both ways and found that I really couldn’t tell any difference. Others of you who’se eyes aren’t 50 years old might be able to percieve a difference, but if you’re planning on using this with an iPhone, I’d suggest that you try it first before breaking the shell open. While I wouldn’t want to use this as a PC screen, I could read the print equally well in either case and it will meet my needs for watching the news on the train. One thing I added was a switch so I could turn the headset off when I’m not using it. I also taped on a pair of ear buds, taped the wires together and ran the combination over the back of my right ear, where they’ll run down to my suit pocket where I’ll keep the iPhone and battery pack. I sent a photo taken with my iPhone to show the entire setup. When are these going to be in stock again???????? Why won’t they be in stock ever again? where can I get a set of htose spy goggles?? So… what size was that resistor???? I’ve been there, Mr. Lopez! Luckily for you, the component in question is more of a jumper than a proper resistor so it can be replaced with nothing more than a bit of wire or a solder bridge. Good luck! As the display alone will never be available again on the store… is anybody able to find out brand&model of the raw display and its “controller”? If already coupled they cost 25$, buying them separately should cost even less! But WHERE to buy? WHAT to buy? where else small monitors are used? Maybe some of them are cheap enough? But the whole idea of ” spy gear ” is to have covery equipment. if it is so evicent it is no longer in the spy category. Here is a question for an electronics idiot and a dreamer. IS IT POSSIBLE TO USE THE LCD HEADSET IN SUCH A WAY? (1)remove yet maintain connection with a camera from a old camera phone and make for lack of a better term an extension cable. (2) mount the cell phone camera with “extension cord” to the headset. (3)share the video signal with both LCD headset and cell phone camera. (4) If possible could it be designed to be plug in and plug out if you wanted to use the wireless car camera. I apoligize if this is a bit clumsy in explanation. My idea is that with utilizing the cellphone camera and extending it you would now have a camera with the capability to be mounted with the headset LCD viewer. In addition if you can share the video feed from the cellphone camera to both the headset and camera itself,a micro SD chip would allow you to utilize the functions of the cellphone to save both pics and hours of video. Combine this with a good IR illumination source and you have not only great night vision goggles but also recording and cell phone capabilities of sending to others. I guess the icing on the cake would be if it was designed in such a way that you could utilized the cell phone then unplug and use the car unit as well. I hope I get a reply on this one. I am an electronics idiot but this is just a concept. I have searched and searched and have found nothing about anyone hacking into cell phone in regards to the camera. Sorry folks I had a typo I meant “FROM”an electronics idiot and dreamer not “FOR”. Please excuse me. Possible, yes, but not really doable by anyone without a masters in electrical engineering and a lot of time on their hands. The signals that come out of the camera element in a phone have pretty much nothing to do with those our display accepts, so you would need a boatload of circuitry to convert. If, on the other hand, you have a camera phone that can natively connect to a TV, the process will be rather simple. The iPhone is the only phone I know of that can do this, but most digital cameras (even old ones!) do it just fine. …messed up the link there…..
IS IT POSSIBLE TO REMOVE THE CAMERA FROM A CELL PHONE AND MAKE AN “EXTENSION CABLE” 2 FEET OR MORE, FOR THE CAMERA WITHOUT HARMING THE PHONE? Coool hack.. i intend to try this out.. might save me a few bucks if i can figure out(dud me so far) where i can buy the replacement headset alone.. I just finished hooking this up to a button spycam. One problem though. A small portion of the top of the view is on the bottom portion of the headset screen. Looks like a horizontal is messed up. Is there a way to fix this? Also the view is extremely bright outdoors. Steven: It sounds like your camera and screen are in mis-matched modes (NTSC/PAL). If you did the above mod correctly, the screen will be set up to receive NTSC signals. This means that you either did not do the modification right, or that you camera is PAL (did you buy it from a non-US retailer?). To find out which it is, try hooking the camera up to a TV. If it displays OK, than you likely need to re-do the HMD mod. If it displays the way it looks on the HMD, than it is a PAL camera and you need to un-modify the HMD (as it is PAL out of the box). Please let me know how you get on with this. The button camera always looked fine when hooked up to the television. It did come from Hong Kong though. I tested it before I got the HMD and it always looked fine wen hooked to the television. Yup, that should do it! My headset is coming soon… soon as in, 2-4 weeks. I can’t wait. I will convert it so that not only will it work with my night vision device, but I’ll also make a small converter for it so I can use it with other devices. Hey Jack, I was wondering how you would recommend I open up the headset? In your main post you said not to pry it open with a screw driver because it might break a connection. I missed out on the last time wildplanet sold the headsets. Now they don’t sell it anymore. I have a project in mind and need the headset. Does anyone know where can I still buy the headset ? I would be willing to buy from someone if they want to sell one to me. I’m having a bit of a problem with my HMD and Windows Vista. I’ve a number of bits and pieces together in such a way that my HMD gets power from a USB port and displays video input from an RCA jack. I’ve also scraped off the resistor limiting the HMD to PAL resolution, thus switching it to NTSC. The HMD works beautifully when I connect it to my Playstation 2 via the PS2’s RCA cable. However, when I connect the HMD to my Vista computer via an RCA to S-Video convertor cable, I only get brief flashes of the desktop wallpaper whenever I attempt to change my monitor settings, and otherwise the HMD displays a blank white screen. Any thoughts/ideas as to why this is? DISCLAIMER: I am an avid Linux user, it’s just that the Vista computer was the only one I had available with an S-Video connector 😉 I plan to hook up the HMD to my Gentoo laptop once I procure an RCA to VGA convertor. any news about where to find similar displays at similar price?…. But I don’t know how to “wire” it: is anybody able to make a suitable schematic? A couple of REALLY interesting links! I actually just went and bought the entire car set to get this headset. Now I have two awesome things! So I’ve finally begun fiddling with this thing. I put together a battery pack / 1/8″ jack to composite adapter . Then I removed the LED so that I could place the screen next to the board (instead of behind it). I had some trouble with my new cold heat soldering iron so I may need a new LED, but we’ll see. 1. The screen component is still quite a bit thicker than I’d like. I wanted to make an eye-patch or monocle out of it, blech! I poped open the screen and saw why this is – tiny LCD, lots of space, lens. Does anyone know if this board can drive a larger LCD? 2. I’m getting vertical white lines in the display. I don’t know if my brutish hand with the soldering iron broke something, but it looks like some kind of noise in the signal. Any ideas? I have a problem, I would love some help. I scraped away the resistor to switch it from PAL to NTSC, but now it seems that the image has been moved up about 1/6 of the way up the screen. The remaining portion is now at the bottom! Could someone tell me what I did wrong? I bridged the connection with solder, if that means anything. 2) Aye, it sounds like you may have indeed damaged something. My guess would be my all-time most hated electronic component: the ribbon cable. They sever like wet tissue-paper, and white lines would suggest that a signal or two is straight-up not getting to the panel. @Devrojin: Indeed it does! The “resistor” is actually nothing more than a fancy solder bridge, so you have in fact changed nothing–meaning it is still in PAL mode. Sever that bridge any way you can, and your problem should be solved. Thank you so much Jack of All Trades! My headset works perfectly now! I tested the image with GTA4! It was perfect! So, I’ve given up trying to make my HMD work with Vista… as I posted earlier, I’ve wired it up to accept RVA/S-Video/VGA input and take power from a USB power. I am currently attempting to get my HMD to work as a secondary screen for my laptop (Compaq Presario 2200), which has just had its OS reinstalled and is now running Ubuntu Linux. So far, I have been unable to get the HMD recognized as a second monitor or external TV when I plug it into my laptop’s single VGA out. Again, I’ve chipped off the “resistor” to force the HMD into NTSC mode, and the HMD still works perfectly with my Playstation 2. However, the primary reason behind my purchasing of the headset was to use it with my laptop for mixed-reality applications, specifically real-time facial recognition. SO, if anyone has any suggestions regarding hooking the HMD up to a Linux laptop as a secondary output device, I would love to hear them! Ok so if I move the box to the 2 blank pads that will do exactly what now? Also what do you mean by the above quote? Sorry about the 2nd post in a row… I am trying to directly connect the camera that came with the car to the HMD and I don’t know anything about wiring power. I’m assuming I can just connect the video in to the vid out wires but like I said, I don’t know how to hook up the power for each so they’d run off of one power supply, and lastly, what kind of battery power supply should I use? OH I’m so doing this!! the board in the car is small enough to built into an enclosure for rail mounting, basicaly just using it for the camera and wireless video transmitter. on the recieving end howerever, the remote control board is rather bulky. I am thinking i only need the wireless video reciever off of the thing, but am not sure exactly how to apply power to it or wire it in with the display. if it is posible to do so directly, i’m not sure what the power requirement would be. I guess my question is, if anyone is familiar with the full spy car kit, if it is posible to use just the wireless video reciever and display from the control unit. if so, how would power be applied. I too am working on a video weapon sight for airsoft. The receiver is the easy one since its only connection is soldered on wires. I found that the colors of the wires were somewhat arbitrary as the yellow wire ended up being power (+3.3v) rather than video, and the red wire was video rather than power. Black is still ground. The transmitter was much more difficult to seperate from the car as it is soldered directly onto the circuit board with 12 pins. I fear that I damaged the transmitter with too much heat when I de-soldered it (never desoldered something before). Either that or I got my pinouts wrong on the transmitter, but Im pretty sure thats not the case. So… does anyone know the correct pinout of the transmitter? I would like to confirm with my own findings. If I did indeed damage the unit I may have to just buy a new TX/RX kit from somewhere. Thanks! This hack worked great for me but I was wondering, are there better color quality HMD’s that can plug into a small spy camera? Hi, i was wondering if anyone has any of the old microvision nomad head-up displays ND2100 or 2500. I am in desperate need of some for some research i’m doing and i’m getting desperate. willing to pay reasonable price. Hi, I have two spy displays that I am selling for $30 a piece. I also have two color 640x 480 xybernaut HM-4 Xyberview displays that I want to sell. Please email me Thanks. Has anyone tried to thin out the display depth? It’s pretty bulky as is. Can you view the lcd without the optics in front of it? Some guy did it. I saw a video of him mounting the display inside regular sunglasses. Now I can’t find the link! I wonder if the headset is even better? Anyone know where to purchase the Headset only? i guess wild planet doesn’t have them again. I have 2 of these headsets for sale. One is brand new, untouched, and the other is brand new, but has had the resistor removed to make it NTSC. Although they both display video from my Canon soint and shoot when hooked up. Cost me about $45.00 each to order and get them to me, I will sell them for $35.00 each shipped in the Lower 48 or Canada. I got them to use for shooting Aerial photos with a RC helicopter, but never got around to hooking them up. I have now set up a new $300 video headset for shooting so have no need for them. If you are interested, send an email to fotocalc(at)shaw.ca. Don’t post here if you want to buy, as it is unlikely that I will see it, contact me by email. Found just the eyepiece laying around a thrift shop and for a whopping $2 it was mine. A little rummage around the for adapters and wire and had it up and running secondary screen for a laptop via S-video with USB power. I’ve worked with industrial robots in the past and would have killed for something like this at the time for some quick vision tests or on the fly reprogramming. Kudos on a well documented tear down. PS, I had a quick look at the next generation of spygear toys, seems they have a newer model, with sound and a tank tread setup as well as video. Hoping they offer similar replacement parts. So if you have a small project box w/battery clips (free as a sample from one of the links on this page) a $1.50 3.5mm 3 conductor stereo headphone jack, a $1 rca jack and 12v single cell bat (all availabe @ Radioshack, from links posted here) you could put together a nice little power source for the headset w/jacks to plug the headset and rca video source, wired or wireless. My point to other newb’s (self included), even if the blog has houndreds of posts, read b4 asking. You are already interested or you wouldn’t be here (whereever here is), you’ll learn more by reading the posts and probabally get ideas to make your own improvements. btw – Jake, AWSOME & Thanks! Take a look at the text surrounding the second photo in this post regarding the gain control pot. While there is no (simple) way to adjust contrast by itself, messing with gain should help you out quite a bit. When it comes to displays like this, gain is sort of a combination of brightness and contrast. If you still need another variable to fiddle with, check out the A300 datasheet–pins 3,4, and 30 in particular. By replacing the fixed-level resistors WildPlanet used for the voltage dividers with appropriate potentiometers as shown on pg. 11 or the datasheet, you should be able to adjust the display’s black, white, and gamma levels as well. Now the built-in gain control pot made all the adjustment I needed, so I have not done any of the modifications I just spoke of. They /should/ work, but you should probably double-check my thinking before you plug in the soldering iron… Let me how it goes! how do i fix my atv video spy car 360. it wont turn. and sometimes when i move both sides there no picture. Where abouts are you? I went again and the shelves were restocked again. The heads up display is next. Thanks for the nice writeup, Jake. Where can I buy such a headset ?? Perhaps in Germany / Europe? So the LCD is a tiny B&W one, ya? Do you know the resolution (I didn’t see it listed here). What about replacing it? What would I want to search for to find some kind of similar LCD? Thanks! The display is mentioned in the second paragraph of the original post up top. Hello, I am looking to use a 1.5″ LCD display in a project like this, the one I currently have has (from what I have seen) 8 digital controll pins, and the A300 appears to only have 2 video drive pins. then again the immages show this unit to have 5 digital pins aswell. how do I get the incomming AV signal (IE from a camcorder to the 8 digital pins of my display (using this IC as a base)? Fascinating — I started looking around for Kopin devices like this and discovered a company called “Trimersion” has made a VR system and gone out of business. Trimersion uses color binocular glasses along with gyroscope sensors and can be found cheap on eBay. If you search the classifieds for “Kopin CyberDisplay” on “inetgiant.com”, you may find a guy in Florida who has about 100 BDM-230K Kopin binocular displays (320×240 color) left over from that project in his garage that he’s looking to sell ($45 per unit, requires a 3.3V power supply and you’ll need to attach a composite RCA video input cable to hook it to anything). FYI, date is August 2009. Hi, I got a message from john the other day concerning the Kopin displays. I was the Director of Research and Develoment at Trimersion and headed up the Trimersion VR Game System project. I was sad to see the comany go in the tank as we were coming out of the gate with the game system but unfortnately the management of the company wasn’t as good as the engineering and prouction saff. Remote controlled Spy Cars, Personal Movie Viewers etc. I also have access to the production run of the Trimersion Game Systems that were left in the manufacturers wharehouse in China. that work with USB/Playstation/Xbox/GameCube, Wireless Game Guns with built in gyro-sensors and hmd’s complete with Oriscape vga displays – Gyro sensors – Stereo Audio Amp and A/V Receeivers and Wireless Game Guns. This is very solid technology but unfortunately in the US it is still in the experimenter stage as far as the consumer market goes and HMD’s are still very expensive and hard to come by. I will be glad to make you a deal. I have had a blast working with this stuff and would like to make it available to as many people as possible. If you are interested in any of these devices or need assistance developing your project or product feel free to contact me. It would be interesting to know the prices of items you listed. If your interested drop me a line. I have some quantities and will negotiate. Is this spy video car the same product as the spy video atv? it looks like it. if it is, it’s awesome! they’re suppose to be sold out by 12/9 which is a shame. i hope they get more in soon. It’s currently $40 off, which is great! this would be a Great Christmas present for boys or girls! I got one for my grandson and that’s all he played with once he got the hang of it! It does take the younger kids a little while to figure it out, but once they do there’s no stopping ’em! It does sound like ‘kids of all ages’ enjoy this thing. Some parents have as much or more fun with it as their kids do! I’ve heard that the video and lighting may not be great, but have heard conflicting reports. And you have to manually move the camera, but that’s no biggie really. It’s capabilities are awesome, especially for kids. They never had these when i was a kid! It’s good to know about the replacement headset, and not a bad price. thanks! Anyone know where to purchase the Headset only? coz wild planet doesn’t have them again. Sorry, but we don’t have any headsets left on shopwildplanet.com. As this toy has been discontinued by Wild Planet, no headsets are available. There is a great new toy coming out this fall that has video on the remote control. More information is available on our site: shopwildplanet.com It’s under Spy Gear toys and is called the Spy Video TRAKR. Be sure to put your name on the wait list as this is going to be a great toy! wow really good job ! agree with this….Ah, great tip! Thanks! I discovered that I can run a male-to-male headphone cable out of the remote control, into a video in on an Aiptek-brand MPV (handheld camcorder) and record what the spy video car can see. I was thinking it might be cool to run the signal into a video capture card–maybe that will be my next project. Oh yeah and I totally lucked out–the Toys R Us near me was having a sale on Spy Gear toys–2 for 1, so I got two video cars for $50 each. sh*t, they only deliver to USA!!! where can I find replacement head set? That pack has the same headset, plus you get a bunch of other stuff like a wireless camera transmitter and a wireless camera. my day. You cann’t consider simply how much time I had spent for this information! Thank you! Awesome. Both those above links are broken however. I’ve been looking for something like this for months. Looks like its time to hit EBay or Amazon again. Thanks a million. Does any one have the latest details on getting a spare headset or maybe 2? I have a kit that I can let go for $25. It has the tank and the glasses in an unopened box. However… it will cost $15 to ship via parcel post. pm me at bluevault using gmail. Tried to post link but didn’t show. Search Electronic Goldmine and in home page, search ‘Kopin’. I found the actual lcd matrix, but id really prefer the glasses that come with the car, i cant seem to find a camera compatable with it, let alon just the glasses, I cant spend 60 and waist some of it on a stupid rc car chassis motors etc, what do i do? Does anyone know if it is still possible to obtain these? I ebayed one for $20. This post still delivers. I just used it to rig up a head mounted display for my wearable Raspberry Pi. Thanks!